School-wide food allergy education is a critical and enormous responsibility; lives and self-esteems depend on it. Effective food allergy management is necessary at all times and in all situations. 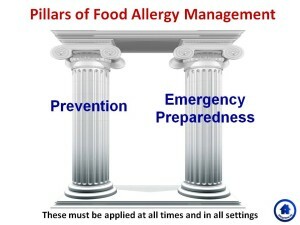 The pillars of food allergy management are prevention and emergency preparedness. Very small amounts of food allergen can cause anaphylaxis (severe, life threatening, allergic reaction). To prevent accidental exposure those responsible for students must effectively read labels, prevent cross contact, use efficient cleaning strategies, and communicate clearly. It is equally necessary to be prepared for an allergic emergency. Those responsible for students must be able to recognize an allergic reaction, have epinephrine (first line, treatment of choice for anaphylaxis) available, know when and how to use it, and know to contact emergency services immediately. These strategies are always necessary and the school setting is no exception. Implementing solid food allergy management is challenging and takes knowledgeable administration, school nurses, school staff, and school community. Traditionally, the responsibility to educate those responsible for the care of the child with food allergies has been shouldered by the child’s parents. Additionally families have done the heavy lifting when it comes to educating the other parents and their child’s classmates. This can be a socially and practically challenging responsibility. It is hard to accurately and effectively teach all necessary prevention and emergency preparedness skills at a time that works for all. Having parents of individual students teach staff, as well as other parents and students, can also be socially daunting. Relationship dynamics can sabotage even the best educational effort. Also, some children with food allergies may feel uncomfortable and some, unfortunately have been singled out and the subject of teasing and bullying by others. Educated and understanding school communities (nurses, administration, staff, parents and students) can help create safe and supportive environments for children with food allergies. Knowing why kids with food allergies need to do certain things to take good care of themselves can go a long way in keeping school communities from dividing over food allergy issues. Awareness and understanding can help create communities of support and inclusion. School nurses and physicians, healthcare providers, school administration, staff, parents and students must partner with one and other. Not only should policies and procedures be implemented to manage a child’s direct care but to also include universal education and awareness for all staff, parents, students and others in the school community. Students are influenced by the messages of their teachers, parents, and others in their schools. Bullying may arise when there are misperceptions and negative attitudes about food allergies. Replacing these with education can create an environment of support and understanding. Educating staff and parents can change the attitudes of children. Direct education to students may be very effective. Children also can play an important role in teaching each other, their parents, and play a critical role in establishing a supportive community. We all play our part in creating communities of support. As food allergy awareness has been spreading across the country, more and more states have developed effective guidelines to help implement management strategies and regulations. Additionally, National guidelines from CDC, Voluntary Guidelines for Managing Food Allergies in Schools and Early Care and Education Programs, are now available to help guide school policy in states that don’t have their own. These guidelines and guidance documents serve as an excellent foundation for schools to implement school policies and efficiently take on the responsibility of school community education. Parents will no longer need to recreate the wheel to manage and educate their schools on their own. As more members of our school communities become food allergy aware, a potentially heavy burden gets a whole lot lighter. What Parents Of Children With Food Allergies Need To Know About Food Allergies In School: Part 1: Kids with Food Allergies Foundation Webinar. Anaphylaxis, A How-To Readiness Guide for Schools: National PTA Blog Post With Food Allergy Awareness Resources for All Parents. PTA/PTO Tips Sheet: This one page handout helps PTA leaders share food allergy awareness with other parents in the school community. QUESTION FOR COMMENTS: Who has educated the school staff in your school? Adapted from prior guest posting for Tasterie. Michael Pistiner, MD, MMSc is a pediatric allergist for Harvard Vanguard Medical Associates, as well as a voluntary instructor of pediatrics at Boston Children’s Hospital. He is the father of a child with food allergies and serves as a voluntary consultant for the Massachusetts Department of Public Health, School Health Services. He is a fellow in the American Academy of Pediatrics, where he is a member of the Council of School Health and the Section of Allergy & Immunology. He is also a member of the American Academy of Allergy Asthma & Immunology, where he is a member of the Adverse Reaction to Food Committee and Co-Chair of the Food Allergy Awareness in Eating Establishments Subcommittee. He served on a team assembled to implement a law designed to increase food allergy awareness in Massachusetts eating establishments and is chair of the Medical Advisory Team for Kids with Food Allergies Foundation. Additionally, Dr. Pistiner serves on the board of Asthma & Allergy Foundation of America, New England Chapter, and is a member of the National Food Allergy Management and Education Advisory Board. Dr. Pistiner is the author of Everyday Cool with Food Allergies, a co-author of Living Confidently with Food Allergy, and is co-founder and content creator of AllergyHome.org.